Can you support MS-UK’s Helpline this winter? This month we have launched our Winter Appeal. If you haven’t heard about it before, our Helpline is being contacted by more and more people affected by MS each year that need our help. Last year our team gave information and support to 23% more people than the year before. This year looks set to be an increase of more than 30%! With more people needing our services, we need to make sure that we are here not just today but for the future also. That’s why we need your help! We have created a JustGiving campaign page and are optimistic of achieving our target. It doesn’t matter how much you donate because every little helps! Help us support more people affected by MS today by making a donation. Watch our film to find out more about our Helpline and the difference it makes to people affected by MS. If you’re feeling lucky why not enter our prize draw as well? To be in with a chance to win the top prize of £1,000, or other fabulous prizes for the runners up simply buy your tickets here and make sure you include your phone number. You could be the one getting a very special call this Christmas Eve and a great start to the festive season! If you are doing anything this weekend for Halloween, or going to an event, why not check out our handy toolkit for inspiration and last minute ideas. How about a gruesome lucky dip, pay to dive your hand into a bucket filled with jelly or coloured water and have the chance to win a prize. Fundraising doesn’t always have to be great big events. How about a last minute raffle. Ask your guests to donate a prize, then raffle them off at your party! Even if you are attending someone else’s event – I’m off to a friend’s party and only last week we decided to have a fancy dress competition! We are asking people to donate a £1 and come along in their scariest or most inventive costumes. There are loads of great fun ways to get involved in fundraising, whether it’s a great big event, or a last minute activity, they can be great fun, and a great way to make a big difference! Hope you all have a fantastic weekend, and a truly spooktacular Halloween! If you need any help, or want to show off your last minute ideas feel free to drop me an email at anna@ms-uk.org. Last chance for a free pair of bear ears! Jeanette in her bear ears! The end of October is fast approaching, but you still have enough time to order your MS-UK Christmas cards and get a free pair of Myles bear ears! We have 3 different designs: Angels in the Sky, Christmas Trees and our fabulous Polar Bears! The message inside the card read With Best Wishes for Christmas and the New Year. If you order 3 packs of MS-UK Christmas cards before 31 October 2015, you’ll get a free pair of Myles bear ears! All orders are plus post and packaging. You can order by calling the MS-UK office on 01206 226500 or purchase online at www.ms-uk.org/christmascards. I look forward to receiving your orders! So you want to hold a fundraising event for MS-UK you’re unsure where to start. 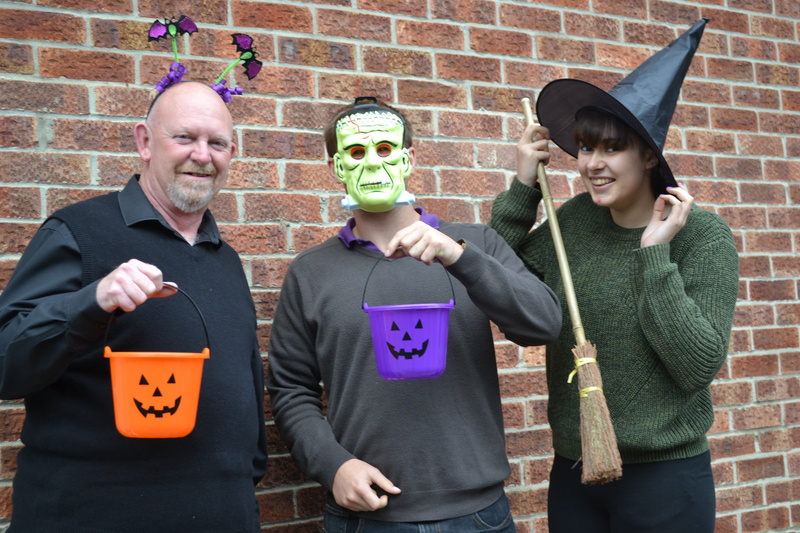 We have loads of handy tips and ideas for you in our Halloween fundraising tool kit. But if you are still just looking for that something different, why not try these monster cupcakes! They are perfect for a bake sale, to sell to friends, at school or even on your coffee break in the office! You can download the recipe here. Come and join in with me for the Halloween holiday season and why not organise your own spooky fundraising event with our Halloween toolkit? As you can see from the photo, I’m always game for dressing up and getting in the spirit of things, some people say I have never looked better!! Why not get your friends to dress up too and have a spooky themed Halloween party. Or how about a ‘carve the pumpkin’ competition with the winner getting a bag of spooky treats? We’ve got lots of ideas for Halloween, so get in touch and I can help. When the evenings get colder and darker it can be boring just sitting around at home but this is a perfect way to use our Halloween toolkit and make those dark nights even more fun and spooky. The toolkit has everything you need for the day and it is really easy to download of our website but if you need anything more please do contact me on mark@ms-uk.orgI am also here to offer advice on best costumes to wear and best face to carve on pumpkins. From your scary looking Frankenstein. Who’s going to help paint Colchester purple? Are you looking for a new challenge in 2016? If so, I’m looking for runners to take part in the Colchester Half Marathon which takes place on Sunday 13 March, 2016. The half marathon which takes place in our home town starts and finishes at Colchester United Football Stadium and the varied route means you get to run through the historic town of Colchester as well as some of our beautiful countryside. The staff and volunteers from MS-UK will be on the route cheering you all on and having done a half marathon myself (check out my photo) I know the buzz you get from completing the distance. You’ll also know that you have done something amazing and helped raise vital funds for MS-UK. I will be here to support our runners throughout their training and all of our runners will receive a welcome pack and team top. We will also be hosting a post-race reception at our office where our runners can have a well-deserved sports massage and refreshments…..and cake! You’ll also get to see first-hand how your fundraising efforts supports the services MS-UK provides to anyone affected by multiple sclerosis. It doesn’t matter whether you’re a beginner or you eat half marathons for breakfast, come and run for MS-UK and do something fantastic in 2016!! Contact me on mark@ms-uk.org or 01206 226500 for more information, the Colchester Half Marathon will sell out so get in contact now! Everyone knows their local library – it’s that place where you get books, CD’s and even do some photocopying! Libraries are really great community hubs, so we were pleased to be asked to hold a drop-in session at Braintree on Wednesday last week. We had already had a very successful visit to Halstead library earlier in the year and we were very pleased to extend this service to another area. The lovely library ladies had already done some advertising and the result was a mention in the Braintree & Witham Times. That certainly paid off, as the first visitor to the MS-UK stand was a woman who had seen the news piece and as she had been recently diagnosed with MS, she felt she needed a bit of direction as to what to do next! Conversation flowed and soon we were joined by another couple who already know MS-UK well. They have used Josephs Court our wellness centre and have been long standing subscribers to our magazine New Pathways. One of the areas that the Helpline gets asked many questions is about benefits. This is a complicated and confusing subject. My last visitor of the day was facing the prospect of changing over from Disability Living Allowance (DLA) to Personal Independence Payment (PIP) very soon and she needed some help as to what to expect over the next few weeks. Our Helpline staff have all received welfare benefits training and in addition, we are members of Disability Rights UK, so I am pleased to say that we are able to answer most people’s questions on DLA and PIP. As I am mostly in the office it was so nice to be out in the community and be able to chat to people about their daily lives living with MS. We don’t always solve everyone’s problems, but that old adage “a problem shared is a problem halved” is very true indeed! We are so pleased with our visit to Braintree that we plan to repeat the session in about six month’s time. Meanwhile, our next drop-in session will be at Witham Library, 10am to 1pm on Monday 30 November 2015 – see you there! The toolkit has everything you need for the day and it is really easy to download off our website but if you need anything more please do contact me on mark@ms-uk.orgI am also here to offer advice on best costumes to wear and best face to carve on pumpkins. Run for MS-UK at the Colchester Half Marathon! Registration is now open for the Colchester Half Marathon, which takes place on Sunday 13 March 2016. The Colchester Half Marathon is such a popular event, it sells out months before the race takes place so save the date and get in touch with me now before it’s too late! As part of the MS-UK team, you’ll get your very own welcome pack, MS-UK tech t-shirt or vest and a post-race reception at our very own premises in Colchester, Essex. You’ll be treated to a sports massage after the race and plenty of food and drink, plus if you need any tips or support to fundraise I am here every step of the way! Give me a call today on 01206 226500 or email me at mark@ms-uk.org to find out more. Can’t wait to see you there! Whoop! We’ve got some brilliant ways for you to help support MS-UK during our Winter Appeal and you could even win £1,000! Whoop Whoop – that will start your festivities with a bang! We launched our Winter Appeal to help raise funds for the MS-UK Helpline. From January to June of this year, the Helpline provided information and support to 851 people which saw a 56% increase from the same time last year. Our Helpline costs £2,493 a week to run so our Winter Appeal is vital in helping ensure we can continue to provide this service. How can you help? You can enter our Winter Draw with a chance to win the top prize of £1,000 with other fabulous prizes for the runners up. The winning ticket will be picked on Christmas Eve and we will be contacting the winner the same day! Buy your tickets hereand make sure you include your phone number; you could be the one getting a very special call. Or, you can support our Winter Appeal by making a donation. It doesn’t matter how much you donate because every little helps!